The Oakland A's of the early 1970s were the most transformative team in baseball history. Never before had an entire organization so collectively traumatized baseball's establishment with its outlandish behavior and business decisions-or with its indisputable winning record: five straight division titles and three straight championships. The high drama that played out on the field was exceeded only by the drama in the clubhouse and front office. But those A's, with their garish uniforms and outlandish facial hair, redefined soon...virtually every aspect of the game for coming generations. Under the visionary leadership of Charles O. Finley, the team assembled such luminary figures as Reggie Jackson, Catfish Hunter, Rollie Fingers, and Vida Blue. Finley acted as his own general manager, and, with an insatiable need for control, dictated everything from the playlist of the ballpark organist to the menu for the media lounge. The advent of free agency spelled the end of Finley's reign; within two years, his dynasty was lost. 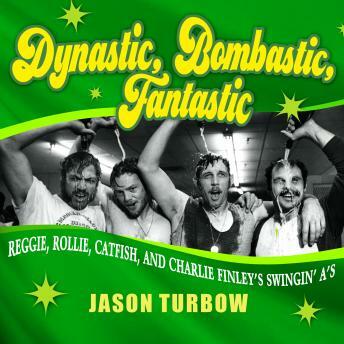 A sprawling, brawling history of one of the game's most unforgettable teams, Dynastic, Bombastic, Fantastic is a paean to a turbulent yet magical time.